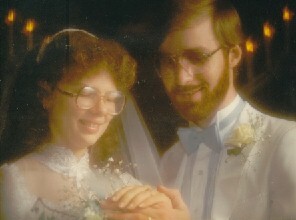 Twenty-five years ago, when Terri and I were planning our wedding ceremony, we thought we had marriage all figured out. Today, we have more questions than answers. We designed our marriage service as a program to get the "truth" across to the others who attended. But in the final evaluation, it appears that our primary audience was ourselves. 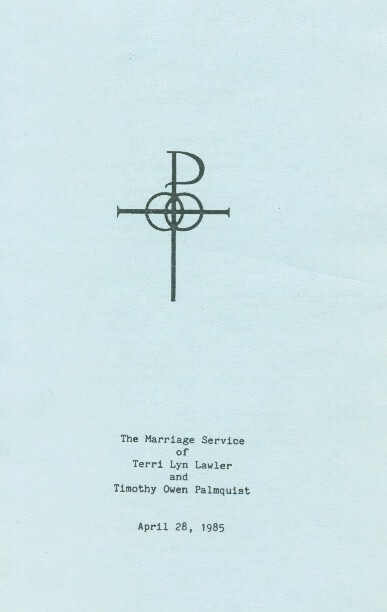 When Terri and I were engaged in the summer of 1984, we began preparing for a wedding ceremony which we believed would be a significant event not only in our lives, but in the lives of others who would attend. 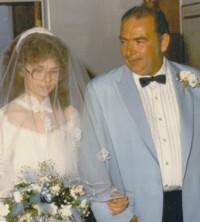 The most important person on our minds as the wedding day approached was William Randolph Lawler, Terri's father. An alcoholic who practically lived at a bar since the day he abandoned Terri and her mother, he was not interested in hearing us talk to him about God. Terri had a deep desire to see her dad come to Christ, and our concern for him became a major focus of our wedding program planning. We even chose to schedule the wedding on his birthday, April 28. 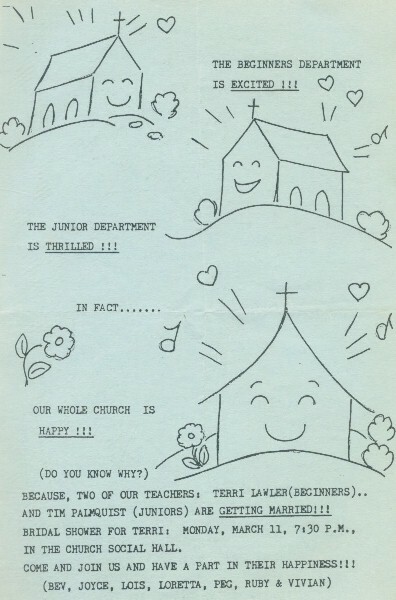 The congregation was "excited" and "thrilled" when they heard that we were getting married. In the past I had seen so many Christian weddings where the focus of the wedding seemed not to be on God, but on sappy, romantic affection (or worse! I vividly recall attending church weddings where Christians happily danced to songs like "Fly Me to the Moon" and even "Love Shack" afterwards). But the guiding force for Terri and myself as we planned our wedding was a key scripture which was ingrained in our minds: "Unless the Lord builds the house, those who build it labor in vain" (Psalm 127:1). As we understood this scripture, we felt that in order for our marriage to succeed we must focus on the Lord and not on our affection for each other. As Terri often said "together we can serve the Lord better than we can separately." Did we feel those sappy, romantic feelings for each other? Of course!! But we couldn't let that be the focus of our wedding. At times I felt like a wet blanket as we planned our wedding. "Maybe I just think too much," I often told myself. I challenged tradition after tradition, asking how these traditions related to Christian marriage. So many Christians don't seem to have a problem with weddings that are just focused on romance, so I must be the one who is wrong. Some traditional aspects of the wedding ceremony to me seemed to put the focus too much on the bride and not enough on God (but in the end we included many of these traditions, hoping that the scriptural thrust of the wedding would provide balance). It just so happened that April 28, 1985 fell on a Sunday. This fit perfectly with our concept of what a marriage should truly be all about. To us, the Church plays an essential role in marriage. This particular church (First Baptist Church of Delano) was the place we met, the place we worked together in ministries, the place where God began to knit our hearts together. Getting married on a Saturday night would also have meant that the first day of our honeymoon would have been on a Sunday, and that just didn't seem right. But our church was already booked on Sunday mornings and evenings with regular services. We knew that the church would not cancel the Sunday night service, but we thought perhaps our wedding could be held during the service. The pastor (I will call him "Pastor Russell" here) agreed, as long as we understood that he would not shorten the length of his usual Sunday night sermon. Terri wanted to ask Pastor Joe King to help conduct the ceremony. Pastor Joe had been a very important part of Terri's life, giving her a shoulder to cry on and a listening ear during a time in our relationship when I was pursuing other interests. So it seemed appropriate for Pastor Joe to share the responsibilities of conducting the wedding ceremony with Pastor Russell. The key scripture which was read during our wedding ceremony was, of course, Psalm 127:1. But because of my belief that it is always important to quote scripture in context, I wanted the entire Psalm to be read, not just this first verse. As my father, Richard Palmquist, stood up to read the scripture, I had no idea how these holy words would set the course for our lives (or how bitterly ironic it would later become that my father was chosen to read those words). At that time, Terri hoped to have two children, and I thought five would be a good number. But the words "Children are a gift from God," and the concept of having a "full quiver" of children to fight the battle God was calling us to continued to challenge us throughout our lives because they were read in this service. The concept of "faithfulness" was also a central part of our marriage service. While Terri and I pledged to be faithful to each other, we knew that it was only in the context of God's faithfulness to us that we could succeed. We knew that God had a plan for our lives and that He would be faithful to that plan, but could we remain faithful? A few years earlier, our church had been rocked by a scandal of unfaithfulness: one of the key leaders of the church, someone I admired throughout my formative years as he taught Sunday School and led youth meetings, had run off with the wife of one of the staff members. The affair lasted for a few months, and then he returned home. His wife and church forgave him and received him back into fellowship (and leadership), but the staff member was fired. Because of the way in which this man symbolized the pain of infidelity and the blessing of forgiveness, we asked him to sing "I'll never let go of your hand," a song about how God is faithful to us even when we are not faithful to Him. The key line in the song which kept ringing in my head was "even if you do it wrong, and miss the joy I've planned, I'll never, never let go of your hand." These words have been a comfort to me throughout the past twenty-five years as I have experienced the pain of my own failure to walk in the fulness of God's plan for my life. The hymn "Great is Thy Faithfulness," which was also sung at our wedding, always fills me with a sense of deep gratitude and trust in God for being a faithful leader and provider throughout our marriage. We have experienced many times of uncertainty when our survival as a family seemed to be uncertain, but the words "all I have needed Thy Hand has provided, great is thy faithfulness, Lord, unto me," have always proven to be true. Whether we are being shaken by internal forces or external forces, "Morning by morning new mercies I see" has been fulfilled again and again in our lives as God shows His faithfulness to us in our time of need. Knowing that God loves us and that He will remain faithful to us gives us the strength to love each other during trying times. Terri and I sang the song "I Am Loved" to each other during our wedding ceremony to express our commitment to draw upon God's love for the strength to love each other. (This video excerpt of our wedding includes this song.) As we sang "I can risk loving you, for the One who knows me best loves me most," we had no idea of how many risks we would take because of our love for each other and God. But God has remained faithful to us, helping us to overcome every obstacle the devil has thrown at us. From the beginning it has been our hope that God would be glorified through our lives. To me, to glorify Jesus is to shine a spotlight on him, not seeking the limelight for ourselves. 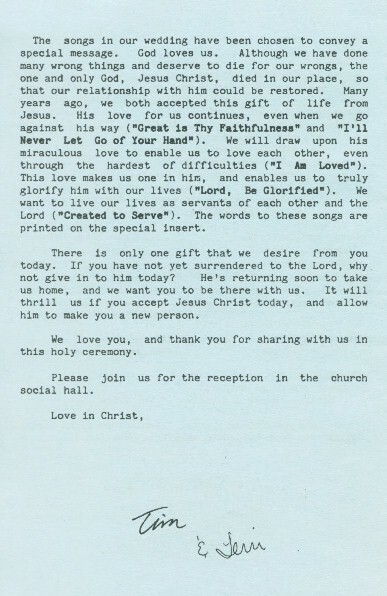 To express this goal in our wedding, Terri and I wrote a new version of the song "Lord, Be Glorified," with several new verses to show how this wedding service was moving us out of a time of seeing God glorified by us as individuals and moving us into a time of seeing God glorified by us as "one life" in Him. As my brother and sister-in-law, Phil and Robyn Palmquist, sang this song, Terri and I took the candles which symbolized our individual lives through which we sought to let God's light shine and together we lit the "unity candle" to symbolize our desire to now let God's light shine through our marriage. To glorify God, we knew that we must focus on service: serving God, serving each other, and serving other people. Another song we wrote, "Created to Serve," was sung to display our understanding of the importance of having a servant mindset in order to succeed in marriage. For me, the song hearkened back to the Garden of Eden, where even in the midst of the perfection of God's original creation God created Adam and Eve for service. They were not just created to enjoy God and each other (though certainly such enjoyment was part of God's plan), but they had tasks assigned to them by God, such as tending the garden and naming the animals. During his sermon, Pastor Russell had taught that the cause of divorce was not incompatibility, but selfishness. Selfishness is the opposite of servanthood. Our song expressed the fact that selfishness would be a destructive force in our marriage: "So how could I hold anything back, that would only drag us down, I am created to live as your servant." As we get our eyes off of our own needs and wants and focus on serving each other and serving God, the differences which once divided us fall away and God accomplishes great things through our willingness to surrender. As a couple who were leaders in the church sang our song, Terri and I shared communion together, because our Lord's sacrifice of His body and blood for us should motivate us to sacrifice our lives for each other. We also wanted the communion elements to be passed throughout the congregation, so that those who had surrendered to Christ would have the opportunity to share in this holy moment of commitment. We knew that some friends of ours were struggling with their marriage, so we looked forward to seeing our wedding ceremony have a positive impact on their lives. We imagined these friends leaving after the wedding with a renewed commitment to sacrifice for each other and glorify God. These friends had a major impact in preparing us for the calling that God would soon place upon our lives. A few years earlier, we had prayed with them as they experienced the ordeal of living through the birth of a tiny premature child, born in the second trimester and smaller than my hand. ("Many children this size are aborted," the baby's mother continually reminded us, prodding Terri and myself to seek to save the lives of such children.) God miraculously saved this baby who went on to become a healthy, growing boy. We prayed that God would also miraculously save their marriage. Unfortunately, the relationship continued to deteriorate after our wedding, and eventually the wife divorced her husband and had him thrown in prison on charges he denies to this day. Sadly, the breakup of this marriage was just the first of many divorces to occur among some of the key people who were involved in our wedding. Even Pastor Russell, who preached so well about the way that selfishness can destroy a marriage, succummed to divorce a few years after our wedding. (We have omitted Pastor Russell's true name out of respect for him, in order to avoid bringing him shame. We greatly appreciate him and the role he played in our lives and our wedding ceremony.) Within a few years, the church itself suffered a "divorce," as the different factions went their separate ways. Finally, over the past year, my parents' 56 year marriage has fallen apart, with our extended family suffering through a series of devastating firestorms. 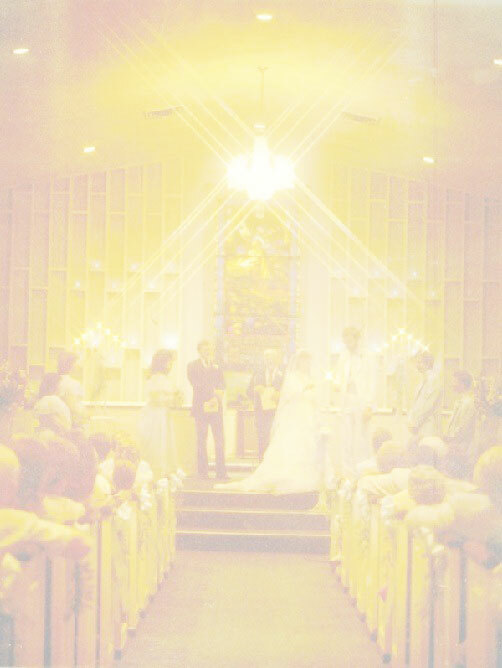 I recall that after our wedding ceremony, my father Richard Palmquist came to me to express profound gratitude for the way that God had used our wedding service to speak to him (I recall him specifically mentioning the song "Created to Serve"). Today as I read what he has written about divorce, I can't help but wonder if he even remembers the holy words he read in our wedding ceremony a quarter century ago. Looking back now I can see that this ceremony that I thought was to be such a life-changing experience for so many was in fact just the beginning of a great battle. Many have fallen victim along the way. So was the goal of our ceremony--focusing on God, His Word and His faithfulness, and seeking His glory as we serve Him--a failure? Not for me! The words which were spoken and the songs which were sung at this holy event have continued to resonate in my soul throughout the years. No, I have not always focused on serving God and glorifying Him. I have not always been "faithful" (although by God's grace I have been faithful to Terri as my one and only wife, there are many ways in which I have failed to be the husband and father God wants me to be). But He has always been faithful to us. 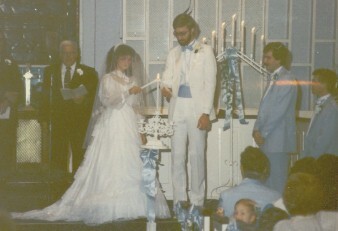 No, Terri and I didn't have all the answers on our wedding day. We have been far from the perfect couple. It is only by God's grace that we are still together. But that day of commitment was the most important day of my life--though I had accepted Christ many years before that as my father knelt at my bedside, it was this day of commitment which God used to propel me forward (many times in spite of myself). In the final analysis, our wedding--and our marriage--was not about us. It is about God! Perhaps this page is like our wedding -- something I wrote with others in mind when Terri and I could be the only ones who are really going to learn anything from it. If it has helped you in some way, I would appreciate hearing about it. A recording of our wedding is available at this link (warning: it was almost an hour and a half long, but you can easily skip parts of the recording if you wish). Please continue to pray for us and for our commitment to each other and to our Lord as we enter into our second quarter-century of marriage.